Interested in becoming a Corporate Affiliate? Welcome to the AAPM Corporate Affiliates site. AAPM would like to thank all Corporate Affiliates for their continued support of the association and the field of medical physics in general. Looking for a Corporate Affiliate? 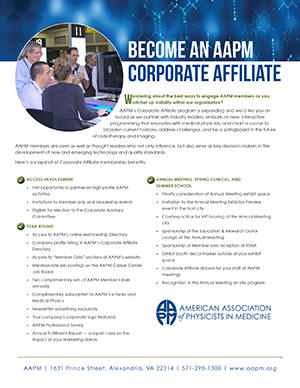 You'll find contact, email, and website information along with a company description and product listing in the AAPM Corporate Affiliate Directory. Corporate Contacts login to view your private Corporate Affiliate Homepage.